The WWEA provides a progressive view on world affairs to radio listeners in Wellington through its weekly community radio programme. The show, entitled Educating for Social Change, is aired on Wellington Access Radio 783AM every Sunday at 4pm. Produced by Alan Windsor, Sue Windsor, Pat Bolster, and Victoria Quade the programme provides a working-class view of current events, while simultaneously training working people in radio production. 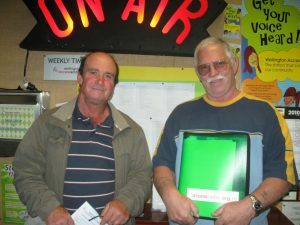 Educating for a Social Change is a community radio programme produced by the Wellington Workers’ Education Association. Join members of Wellington’s WEA as they bring you social comment, community and union news, and look at what people are doing to support a more just and equitable society, every Sunday at 4pm on Wellington Access Radio.